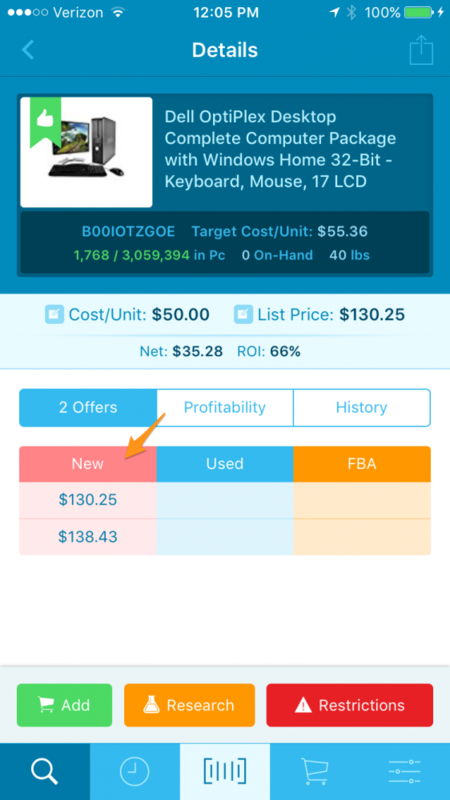 The Offers tab is displayed by default in Scoutify when you are on the Details screen. This section will show you how many total offers are available on Amazon for the selected product. In the table underneath of that, you will notice all, or a portion, of those offers displayed. Note that not all of the offers for the product are always displayed in this table. The Amazon API provides offers that they deem as competitive to display. Their terms and conditions for 3rd party applications, like InventoryLab, prevent us from being allowed to show all of the offers directly inside of our application. Don’t fret! You can still see that data using the Amazon Listing portion of the Research button! You may also notice small icons next to a listing in the offers table.